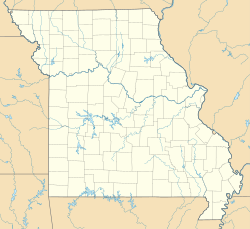 Saint Louis is a large and important city in the American state of Missouri. It is by the Mississippi River. It was founded by the French and named after King Louis IX of France, who is also a Saint. It is often called the "Gateway City" because it was important to settlers traveling out west. Its most famous landmark is the Gateway Arch. St. Louis has a hot-summer continental climate (Dfa in the Koeppen climate classification). ↑ "Visiting the Gateway to The West". Globosapians. http://www.globosapiens.net/travel-information/St.+Louis-698.html. Retrieved 2008-05-15. ↑ "St. Louis City, Missouri - Population Finder - American FactFinder". U.S. Geological Survey. 1980-10-24. http://geonames.usgs.gov/pls/gnispublic/f?p=106:3:3712217792123411::NO::P3_FID:765765. Retrieved 2008-12-23. This page was last changed on 18 August 2014, at 16:22.